If you are a frequenter of Poetry Friday, you know that today is the birthday of a champion of children’s Poetry (with a capital P! )—Lee Bennett Hopkins. And if you are a reader of children’s poetry, you no doubt have been delighted by Lee’s many poetry anthologies. To celebrate Lee’s birthday, I’m going to continue my April project of reviewing a book each Friday and using it to inspire my own writing. I’ve got several Hopkins anthologies on my shelf to choose from, but there’s one that holds a special place in my poetry heart– Spectacular Science, Lee’s 1999 anthology that celebrates science. When I first explored combining my nonfiction bent with children’s poetry, I read and reread Spectacular Science. Study this book and you’ll find the works of master poets, from Valerie Worth to Carl Sandberg, writing about topics that speak to the curiosity of both scientists and children. Others explore the sense of wonder that inspires scientists and young people alike. 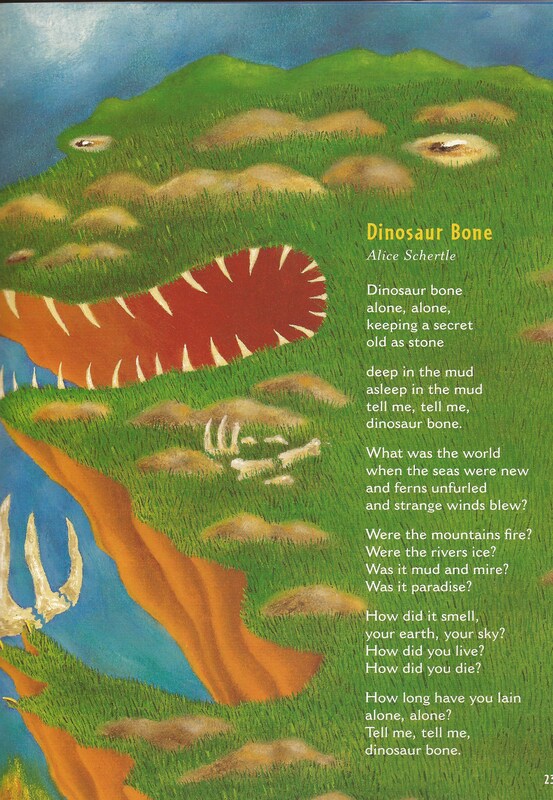 Alice Schertle’s “Dinosaur Bone” is one of my all-time favorite poems. 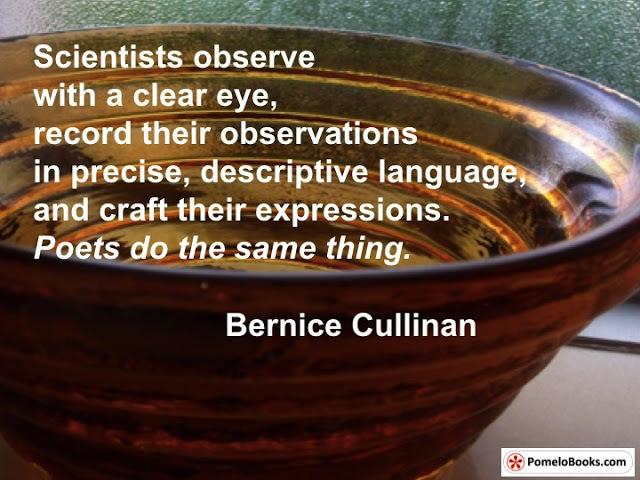 This quote from Bernice Cullinan which Sylvia Vardell posted on her Poetry for Children blog this week addresses how poetry and science are made for one another. Every poem in this collection is a model of clear-eyed observation, wonder, and delightful language. I hope I’ve whet your appetite with a few selections from Spectacular Science . If you aim to write science poetry, you owe it to yourself to find a copy of this book and pore over its contents. where eggs stay safe and snug? that traps a hapless bug? a stream into a lake? a chipmunk or a snake? and plan his midnight caper? and turn it into paper? Head over to Life on the Deckle Edge where Robyn is hosting a birthday party and poetry celebration! This entry was posted in Uncategorized on April 13, 2018 by Buffy Silverman. Hi Buffy! This is a spectacular post on this book, which I’m embarrassed to say is unknown to me. But then, Lee is the creative genius behind so many for me to catch up to. Understanding nature, the seasons, the forces of science that we need to survive, in a lyrical way is crucial for our student’s future & their students’ future. Thank you. And your new poem here, is some kind of Spectacular Science too! Dear Buffy: I just saw this post and want to thank you for the time and effort you put into it. SPECTACULAR SCIENCE is available in a high-quality paperback edition from Simon & Schuster. Thank you, Lee, for putting together anthologies that have inspired so many of us! I was happy to revisit SPECTACULAR SCIENCE. Oh, Buffy, your poem makes me want to go outside and explore. Thank you for this celebration of Lee and the poem you were inspired to write. You have whetted my appetite for more science poetry! This one looks like a gem of a book. A spectacular review and response poem, Buffy! No doubt your poem would be quite content living and pondering with the other ones in this book. Spectacular Science is a treasure trove! I love the varied examples of creature activities and the childlike questions you pose in your poem. You certainly got me thinking! These are all so different – they’re a testament to the vision of the man who pulls such amazing talents together for his books. Thanks for sharing them, Buffy! And happy birthday, Lee! I have many of Lee’s books, but not this one! I’m glad you shared so many poems from it, and always love Alice Schertle’s poems/books, too. 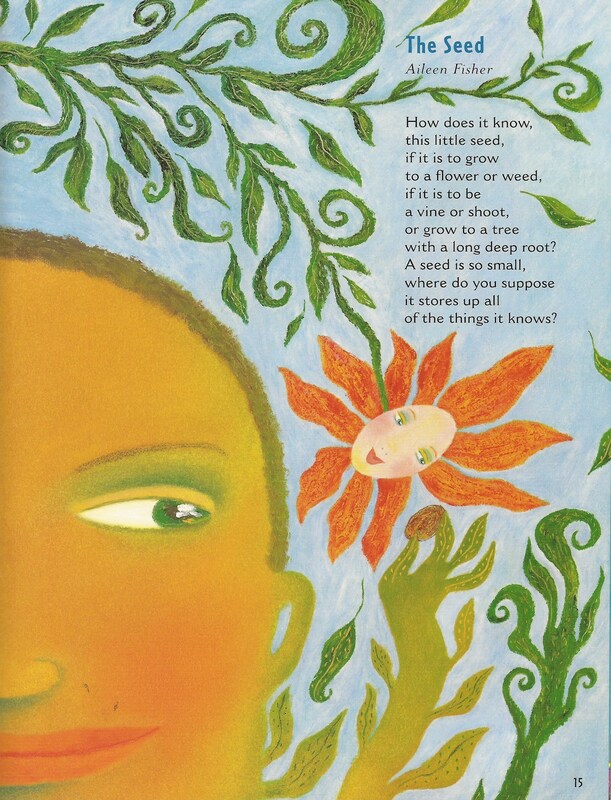 Your poem is a lovely intro to questions for children, us, too, and that ever-wandering curiosity that’s so good in the world. Thanks, Buffy! Enjoyed your fabulous poem too with its spot on questions. Reads so beautifully and brims with child-like wonder. Perfect! Hi Buffy, I like the questions you ask. They track the thoughts I have, although at least a few of the holes in the ground in my yard are from bunnies. 🙂 I hope you don’t mind me linking to your post, since you and Christie and I all wrote poetry inspired by Spectacular Science. 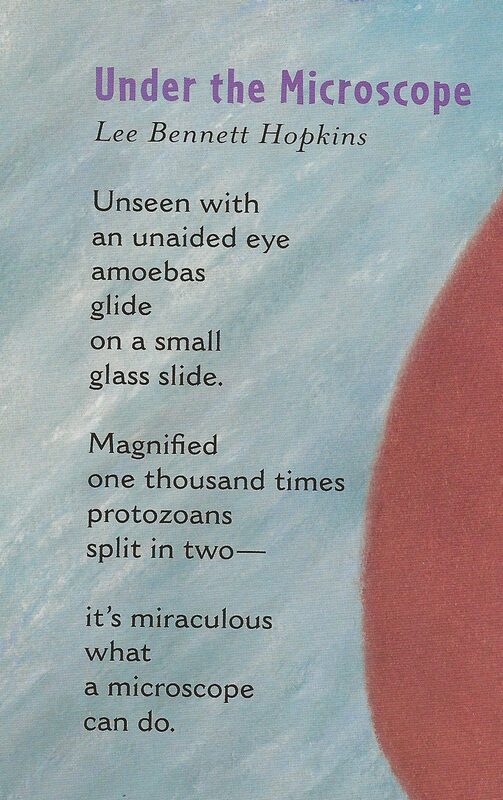 “Spectacular Science” is a favorite book of mine too–beaming with wonder and inquiry, as is your poem here! Thanks Buffy. Well, this POST is spectacular, Buffy – as is your poem. Such a terrific book, and it’s wonderful to read your thoughts about it – you’re one of my go-to science folks, you know! How many worlds has Lee opened up for young folks with his collections? Such a delightful spring question poem, Buffy! Sure to stir a child’s imagination. I love that you have How, Who, and What questions. And thank you for reviewing Spectacular Science.